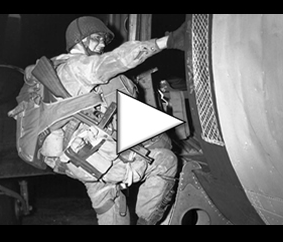 The 326th Airborne Medical Company was committed to action in the Normandy Campaign in a three fold manner – by parachute, glider, and sea on D-Day. The parachute elements were committed directly with the regiment which they were to support. The glider elements were divided into two waves – the first landed directly after the parachutists; the second in the night of D-Day. The majority of the company came in by sea in the assault wave across the beach. Due to the scattered formations in which the troops initially found themselves the parachute and glider elements established first aid posts in the vicinity of the landing fields and began the treatment of casualties. 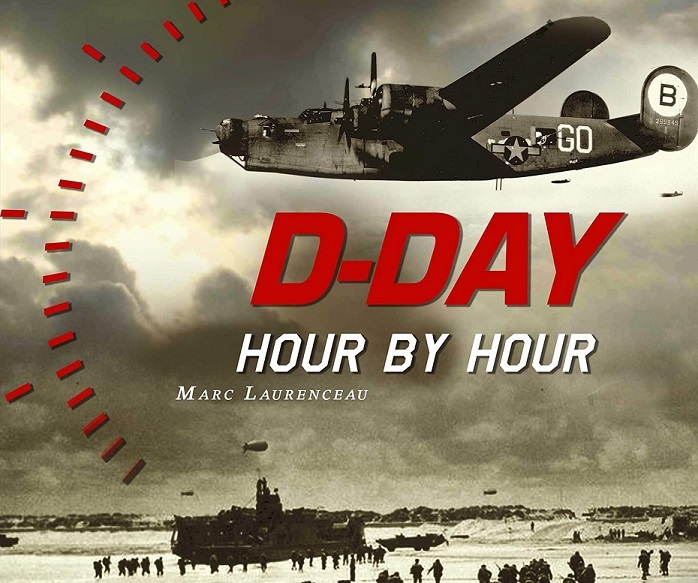 In the early morning hours of D-Day Major Albert. J. Crandall, Burlington, Vermont, senior officer of the surgical team attached to the Medical Company established himself and his group of officers, and men in the Chateau Columbierés, near Hiesville, France. He was subsequently joined at approximately 1300 by Captain E. Curtis Yeary, of Elmore City, Oklahoma. The bulk of the Medical Company led by Major William E. Barfield, of Atlanta, Georgia, arrived at the Chateau Columbierés at 1700 on D-Day. Captain Willis P. McKee, of Eminence, Kentucky, jumped by parachute at the head of his section, established an aid station on his jump field, and joined the company at 2300 on 7 June 1944. Captain Alfred M. Slotta, 4104 N. Major Ave., Chicago, Illinois, who had jumped by parachute at the head of his section, had continued working with the regiment which he was supporting and joined the company on Thursday 8 June 1944 at 1400. Although Captain Slotta had fractured his right ankle at the time of the jump, he continued in the performance of his duties and was not evacuated until 24 June 1944. Captain Walter W. Meyers, of Colome, South Dakota, after jumping with his section was cut off from the remainder of the division for three (3) days and after establishing his aid station began treating casualties. Captain Meyers rejoined this organization on 8 June 1944 at 2100. First Sergeant Otis C. Banker, 7205 South Ada Street, Chicago, Illinois was dropped at Fontenay Sur Mer and after contacting Private Bruscato and PFC Clerk made his way twenty three (23) miles thru the enemy lines to reach the company at 1500 9 June 1944. At 1600 9 June 1944 contact was made between the Medical Company and the 564th Collecting Company, and the first casualties were started forward to the beach for evacuation. The Hospital was dive bombed by an enemy plane at 2335 the night of 9 June 1944 and two direct hits were scored on the station. One crater produced by a delayed action bomb was seventy feet across and 65 feet deep. The treatment of casualties was necessarily interrupted, and the next day the unit moved into a new location, at which time the treatment of casualties proceeded again in a normal manner. The Company operated in this locality until it moved with the division to Cherbourg. During the stay at Cherbourg, the Company operated a station but was more or less static since the division was on a guard status and casualties were only sporadic and few. On 10 July 1944 the company moved again to the vicinity of St. Marie Du Mont preparatory to being shipped back to England. The unit loaded on the L.S.T. at 2200 on the night of 11 July 1944 and spent the night lying off shore. The next morning at 1100 we sailed for England and docked at Southampton at 2300. Thence by train to our billets at Templeton House and Standen Manor arriving at 0200 13 July 1944. The 326th Airborne Medical Company was committed on its present mission in two waves. The first wave, consisting of six CG-4A glider loads transporting, two (2) trucks 1/4 ton, and two (2) trailers, and fifty two (52) personnel, under the Command of Major William E. Barfield, departed from Ramsbury Airport at 1030 and landed at Zon, Holland at 1345 17 September 1944. Among the fifty two (52) personnel in the first wave were the members of the Auxiliary Surgical Team who had accompanied the unit into France on the Normandy invasion. Also with the unit was Major Joseph Witter, of Detroit, Michigan, the senior officer of another surgical Team attached to the unit. The second wave consisting of fifty four (54) CG-4A glider loads transporting thirty one (31) trucks 1/4 ton, twenty three (23) 1/4 ton trailers and two hundred nineteen (219) personnel under the Command of Captain Willis P. McKee, of Eminence, Kentucky, departed Welford Airdrome at 1125 and landed at Zon, Holland at 1410 18 September 1944. The flight was made without incident on the part of both waves except for light to moderate “flack”, encountered in route to the glider landing zone. No personnel were wounded while in the air, no loads were lost, and all equipment arrived in the glider landing zone in serviceable condition. In the initial wave the two trailers were loaded with two ward tents and the necessary equipment to set up two operating tables, electrical power, in the form of two field generators, were also transported in these two loads. The gliders were unloaded immediately and no difficulty was encountered in getting the equipment out of the gliders. The treatment of casualties was begun immediately by the officer personnel while the enlisted personnel ware setting up a temporary station at the southern portion of the glider landing field. Casualties began arriving at the station at 1500. By 1700 the tents were in full operation, and the first surgical operations were being performed. At 1800 the hospital at Zon, Holland was taken over by the company, and the equipment and personnel was moved in by 1900. The treatment of casualties was carried on then under ideal conditions. By 2400 17 September l944 107 casualties had been admitted to the station. The second wave was met as it came in on the glider landing zone on 18 September 1944, began the immediate treatment of landing casualties, was assembled and arrived at the hospital at 1600. The litter bearer and ambulance sections were sent to the respective regiments the night of 18 September 1944. By the morning of 19 September 1944, contact had been established with the combat troops at Vechel, and the attached platoon of the 50th Field Hospital, under the Command of Major John L. Sharp, of [blank] was sent to establish a station at Vechel. On the afternoon of 19 September 1944 the 493rd Medical Collecting Company, under the Command of 1st Lt. James L. Fearon, of Cincinnati, Ohio, established contact with the company at 1500, and at 1610 sixty (60) walking wounded were evacuated to the 24th Evacuation Hospital. At 1800 S/Sgt. Joseph Dugo, Chicago, Illinois, arrived at the station with the remaining ambulances of the 493rd Medical Collecting Company. Due to the moving of traffic north, no further evacuation to the south was accomplished until 0615 20 September 1944 at which time evacuation to the rear from Zon, was non-interrupted. During the 20th of September the unit had 30 ambulances and 14 2 ½ ton trucks available for evacuation to the rear. Since that time this unit has had 10 ambulances for evacuation. On 21 September 1944 at 1500 one surgical team was sent to Vechel to assist the platoon of the 50th Field Hospital located there. This unit remained at Vechel until 14 October 1944 at which time it was moved to Nijmegen, Holland. On 25 September 1944 at approximately 1600 the road between St. Oedenrode and Vechel was cut by the enemy. Evacuation from Vechel south was uninterrupted since then. On 3 October reconnaissance of the Nijmegen area was made prior to moving the company to this area. On 14 October the platoon of the 50th Field Hospital was moved to Nijmegen and the following day was sent across the Waal River to establish a station and support the troops located there. On 5 October the Medical Company was moved to Nijmegen to establish and operate a hospital in the Nijmegen Area. The first casualties were received at the new location at approximately 0900 6 October. The company has continued to operate in its present locality since 6 October 1944. During the period of 17 September to 17 October 1944 the company has treated a total of 2020 patients.